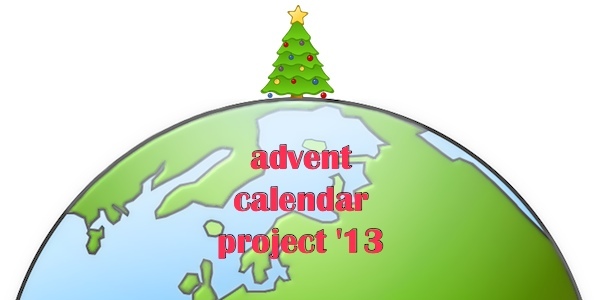 This week we are heading to France for our ornament inspiration. In France, children leave out their shoes for Père Noël who fills them with small gifts. If a child is bad, he or she may be visited by Père Fouettard who gives out spankings. 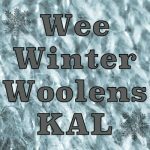 The most common Christmas decoration is a crèche. La crèche is a manger scene, but features more the people of the village: the mayor, the priest, the policeman, the butcher, the baker, the miller, the farmer than a basic set. Christmas tress have become more fashionable over time and often small sweets, fruits and toys are hung on it for children to find on Christmas morning. 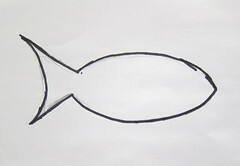 Fish, which were once considered a New Year’s symbol for long life, have also become a popular design for French Christmas ornaments (Fish is also a common dish for Christmas Eve in many parts of France.) 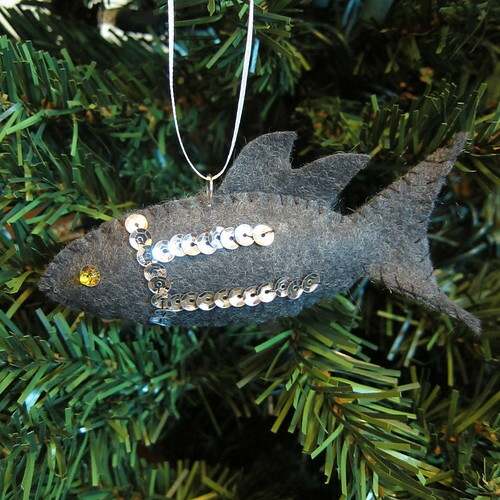 We’ve created our own fish ornament from felt and embellished it with sequins for some shine. 1. 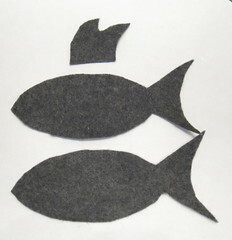 Draw and cut out a fish shape from paper to use as a pattern. Or use mine. 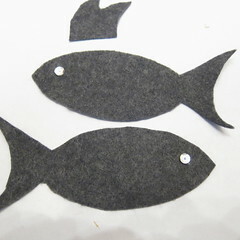 Use the pattern to cut two fish from the felt. 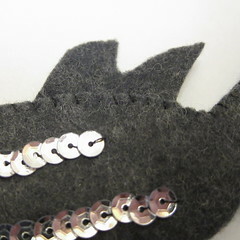 If you want an upper fin, cut one out as well. Leave it long enough to have some seam allowance in the fish body. I just free handed the fin. 2. 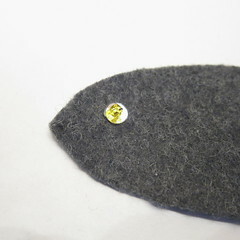 Glue a sequin where you want the fish eye on the front of both fish pieces. 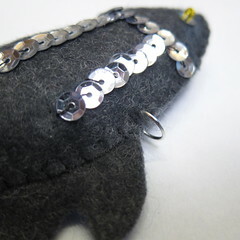 Then sew the colored bead over the sequin. 4. 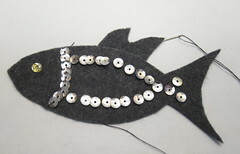 Place the fish pieces together with right sides facing out. If you have a fin, put it in place between the two body piece. 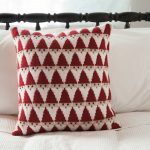 Sew together using a whipstitch. 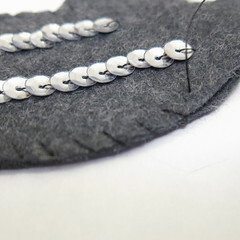 Start at the tail and sew around the body. When you get to the fin, you’ll need to sew through it when going from front to back. Stuff the body. Sew the tail shut, I chose not to stuff the tail. 5. 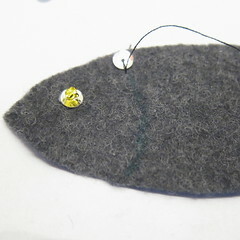 Open the jump ring and push one end through the two layers of felt at the top of the fish toward the middle. A pin or needle can help make a hole to push it through. Close the ring. Tie a ribbon to the ring to hang the fish. 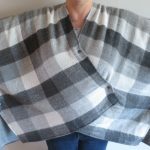 6 years ago by Kat in Advent Calendar Project , Christmas , Holiday , Knitting Socials , Needlecraft , Projects , Sewing , Sewing Projects | You can follow any responses to this entry through the RSS feed. You can leave a response, or trackback from your own site.